LENTILS AND RADICCHIO? YES, PLEASE! I bet many of my readers will consider clicking away from the blog right now, because… lentils? Not the most popular item in the pantry. Radicchio? Not the veggie that jumps into the grocery cart of most shoppers. Both together? Thanks, but no thanks. Can I ask you to trust me on this? Actually it’s not even me you should trust, but someone with a lot more gastronomic fame: Melissa Clark. And credit should actually go to my beloved husband who not only found the recipe but made it for our dinner. So basically I am giving to charity from other people’s wallets. But hey, I am the resident blogger. So there! Make topping and reserve in fridge by mixing all ingredients together in a small bowl. Make the soup: In a large pot, heat 3 tablespoons oil over high heat until hot and shimmering. Add onion and garlic, and sauté until golden, about 4 minutes. Stir in tomato paste, cumin, salt, black pepper and sauté for 2 minutes longer. Add broth, 2 cups water, lentils and carrot. Bring to a simmer, then partially cover pot and turn heat to medium-low. Simmer until lentils are soft, about 30 minutes. Taste and add salt if necessary. Using an immersion or regular blender or a food processor, purée half the soup then add it back to pot. Stir in lemon juice and cilantro. 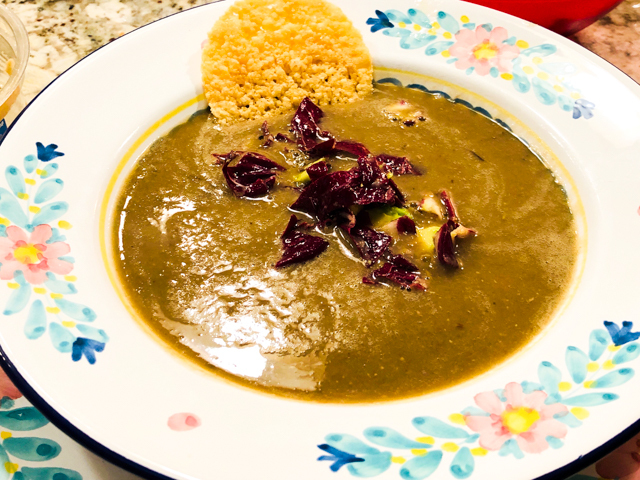 Serve soup and add a generous amount of radicchio slaw on top. 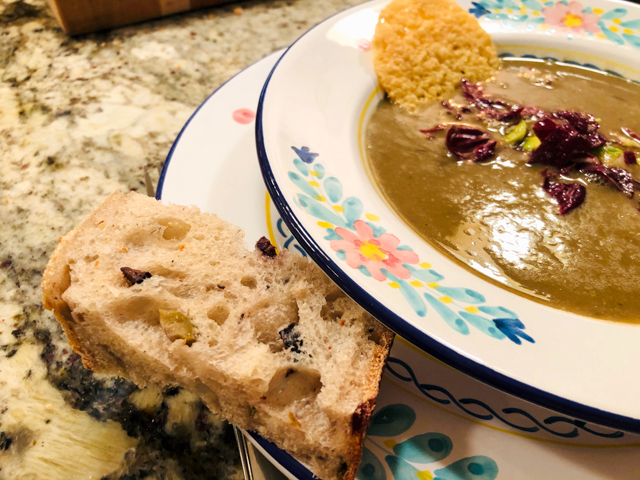 Comments: This soup was excellent served with a mixed olive sourdough (recipe published not too long ago in the blog, click here if you’ve missed it). I find it a bit hard to decide if the topping made the soup or if it would shine as brightly on its own. A perfect combination. We had leftover radicchio slaw, and found ourselves munching on small amounts once our bowls of soup were appropriately empty. Next day we improvised a full salad with the other half of the radicchio head, adding a bunch of goodies we had in the fridge. 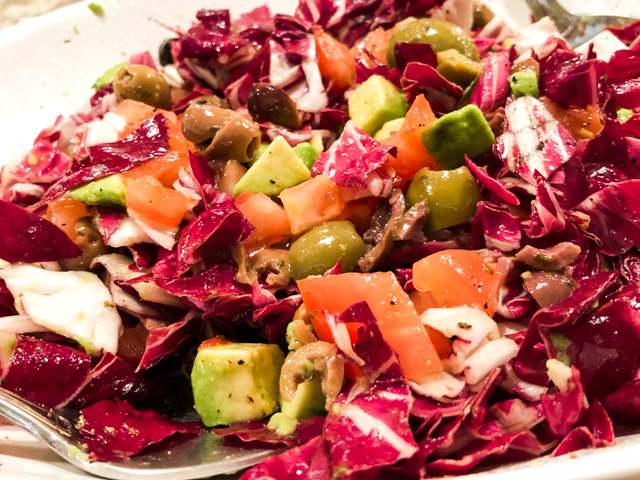 We mixed radicchio, tomatoes, olives, and avocados together. 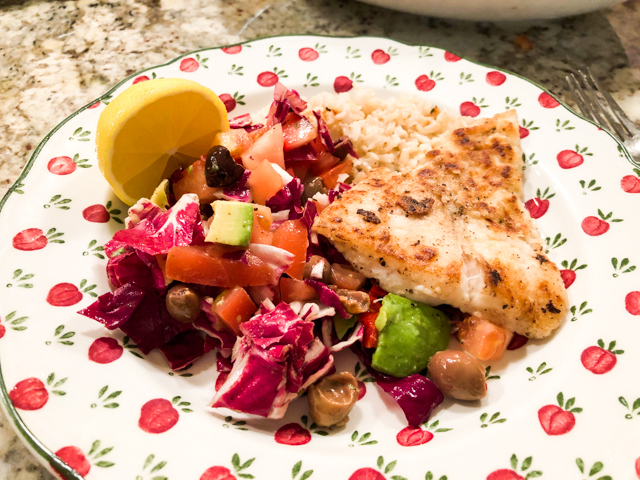 Dressing was kept simple again, olive oil and lemon juice, right before serving we added a tiny touch of white balsamic vinegar. OMG this was good. Later on we decided that capers would have been perfect, and of course some feta cheese or other sharp cheese of your choice. The secret with radicchio is to allow it to sit with the dressing for a little while, or warm it up very very briefly to soften the leaves. But that is another method that I intend to share in the near future. The great thing about this preparation is that leftovers keep very well in the fridge for 24 hours. My lunch next day was this salad with a fried egg, sunny side up. I was a happy camper.